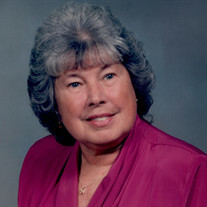 90-year-old Dolores Leasure Carli, of Alliance, passed away Sunday morning at Crandall Medical Center in Sebring. Born in 1928 in Sistersville, West Virginia, she and her family moved to Alliance so her father could work at American Steel Foundries. That work ethic was instilled in "Dee" who was always busy, either working or volunteering. In her teens she blocked sweaters at the Alliance Garment Factory, bucked and chipped plane wings at Taylorcraft as a Rosie the Riveter, and chatted with the world for more than 40 years as a telephone operator at Ohio Bell. Her definition of retirement was volunteering, sharing her many talents, and more chatting: at Christ United Methodist Church as a reading mentor, social tea hostess, hymnal donor, seamstress for the bell choir and devoted member of the Builders Group. Dee thoroughly enjoyed using her sewing skills to make costumes for her son and gowns for her daughter for the Miss America competition. She could be seen around Alliance and Canton passing out samples at pet stores and groceries, filling card racks at hospital gift stores, and taking the Census Count. As President of the Lexington Ladies Ruritans, she helped create a cookbook and kept our roads clear during cleanup weekends. A 1946 graduate of AHS, Dee stressed education. Although she was not able to go to college, it was her number one priority to make sure her children did, with her son, Terry earning his Electrical Engineering Degree at Akron University and working at IBM, and her daughter, Tana, receiving her accounting degree at Akron University, which led to a news anchor position at WJKW-TV8. Surviving her and missing her always-encouraging presence are her son, Terry (Nancy) Leasure and daughter, Tana Carli (Joseph) Dimino, as well as grandchildren Tadim, Tiffany, Todd, Carli, and Joey, and 5 lovely great-grandchildren. She was preceded in death by her husband, Al Carli, parents, James and Mary Leasure, brother Vonley Leasure, and sister Devena Crook. Calling hours will be held from 5-7 p.m. Thursday, January 31, 2019 at Cassaday-Turkle-Christian Funeral Home and from 10-11 a.m. Friday. Dee's funeral service will be held at 11 a.m. Friday, February 1, 2019 at Cassaday-Turkle-Christian Funeral Home with Rev. David Kowaleski officiating. In lieu of flowers, donations can be made to Copeland Oaks Life Care Fund, 715 S. Johnson Rd., Sebring, OH 44672.